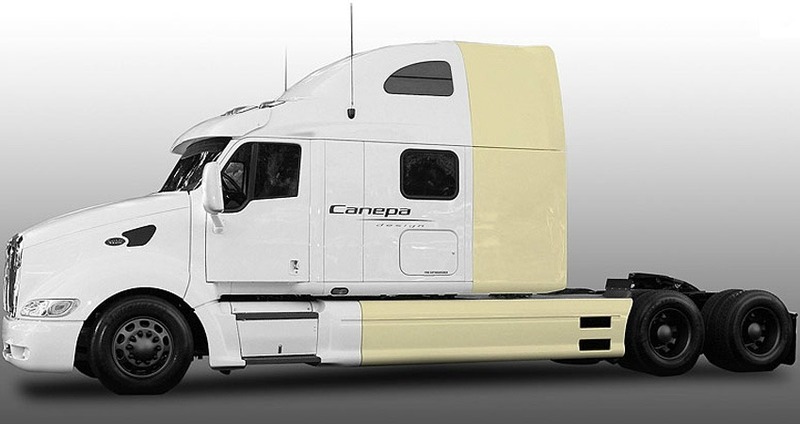 Canepa Design side skirts and side fairings have been specifically designed for the Peterbilt 387 to enhance the style and look of the tractor while improving aerodynamic efficiency. Improving the tractor's aerodynamics radically reduces the fuel required for operation, as approximately two-thirds of each gallon burnt is used to overcome aerodynamic drag. Side Fairing: Reduce aerodynamic drag created by the gap between the tractor and trailer. 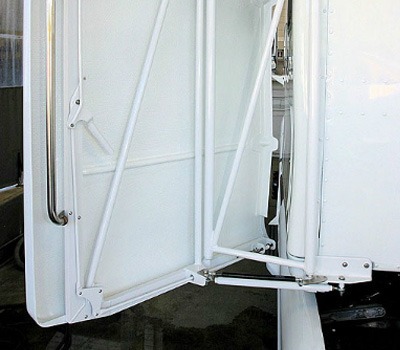 Side Skirts: Reduce aerodynamic drag created by the gap between the tanks and rear wheels, and reduces airflow under the tractor improving crosswind stability. The combined effect of all aerodynamic improvements on one vehicle could result in as much as a 23% reduction in aerodynamic drag. For every 2% reduction in aerodynamic drag, there is a 1% improvement in fuel efficiency. Great care has been taken to design each part in keeping with the lines and style of the factory cab. The parts flow into the factory bodywork seamlessly creating a clean "factory" look. Each part is made of high quality hand laid fiberglass for a perfect fit and easy installation. Both the side skirts and side fairings can be ordered to fit any wheelbase of the tractor. Increase fuel efficiency, decrease wind resistance, save money, and look good doing it. Concept Transporters has custom made to order spun aluminum wheel covers available in a number of different sizes and finishes.